All Pro Restoration works with all insurance companies. Our owner is Master Certified and he personally trains all of our technicians. Everyone at All Pro Restoration is passionate about superior service with a smile – and that is the All Pro Difference! 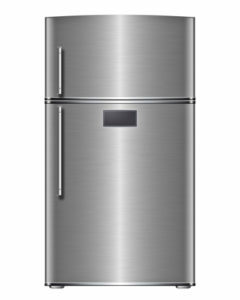 Fridge leaks are most common in side by side fridge/freezer combos that have an ice maker that is currently operational. A fridge leak most often comes from the supply line that supplies the water to the ice maker. A less common type of fridge leak would be from the base of the fridge; this typically only happens with older fridge models. A leak coming from the base of the fridge is often a condensation leak and usually means a fridge is failing. Fortunately, supply line fridge leaks are typically easy to detect because they are a continual leak that happens very rapidly. Unfortunately, though, supply line leaks can cause a lot of damage very quickly. Fridge leaks have been known to affect multiple levels of a home if they fail while a homeowner is on vacation or in the process of selling the home and not currently occupying the home. Even though the source of the water is from a freshwater source, most flooring types are not salvageable after being affected by a fridge leak. Laminate floors swell, wood floors buckle, tile floors crack and vinyl floors peel up. In addition, carpet and pad can typically only be salvaged if caught within the first 24 hours. A leak that comes from the base of the fridge is going to be less obvious and harder to notice. It will be a very slow leak that may take months to show noticeable signs. This is the most dangerous kind of fridge leak because by the time you notice the leak, microbial growth, also known as mold, has likely already formed. No matter what, it is important to have your fridge leak assessed by a 24/7 Restoration Professional as soon as possible. Damages will become worse with every passing day. Do not hesitate to call. An assessment of damages is free of charge to you! For more information on how to prevent fridge leaks, read our blog post here.